The Kangoo Express Z.E. will sell for 15,000 euros in France where the government offers a 5,000-euro subsidy to buyers of EVs. PARIS -- Renault SA plans an aggressive pricing strategy against rivals including Ford Motor Co. and PSA/Peugeot-Citroen SA to win the lion's share of the market for battery-powered small delivery vans that are expected to appear in Europe's cities in the coming years. Automakers believe electric small vans have the biggest potential for EV sales because fleet-operated delivery vans normally are driven the same distances and often along the same routes when in service, making planning when to and where to recharge easier than for private customers. Renault will launch sales of the Kangoo Express Z.E. electric van in the middle of next year, about the same time as Ford starts selling its Transit Connect battery powered van in Europe. 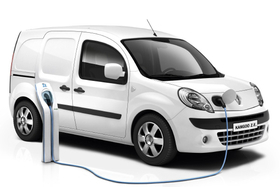 Renault said it will keep prices of the battery-powered Kangoo Express Z.E. lower than competitors. "We will be the cheapest on the market," a Renault spokeswoman told Automotive News Europe. "The [Kangoo Express Z.E.] will be very close in price to the equivalent combustion-engine version." The Kangoo Express Z.E. will sell for 15,000 euros in France where the government offers a 5,000-euro about subsidy to buyers of EVs. In European markets with no subsidies, the cost will be about 20,000 euros. Both prices exclude local sales taxes and the cost of the battery, which Renault will lease to customers in packages starting at 72 euros a month. The gasoline-powered equivalent of the Kangoo Express Z.E. starts at 13,000 euros in France before sales taxes. The Kangoo Express Z.E. 's electric motor has a power output of 44 kW or 60 hp and can run 160km (about 100 miles) on a single charge. Renault hopes the Kangoo Express Z.E. will help boost its total market share next year in the van market, which is among Europe's most profitable vehicle segments with margins of about 10 percent, according to Sanford Bernstein automotive sector analyst Max Warburton. Light vans command higher margins because their relative simplicity makes them cheaper to build than cars, and pricing is usually less aggressive in a consolidated market where many vans are built by joint ventures between rival automakers. Automakers are rushing to bring EVs to market quickly. Ford's Transit Connect BEV (battery electric vehicle) will be the U.S. automaker's first in a lineup of EVs and hybrids when it goes on sale in European markets next year. It will be followed by a Ford Focus battery electric car in 2012. Ford has not released prices for its electric vehicles. PSA said today it will deepen its relationship with Mitsubishi Motors Corp. by starting technical development of an electric version of the Peugeot Partner and Citroen Berlingo vans. The Kangoo and Transit Connect rivals will be made at PSA's plant in Vigo, Spain, starting in 2012.